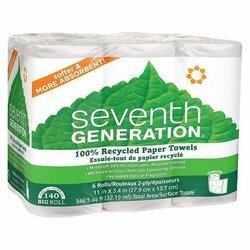 Seventh Generation Paper Towels - 6 Pack. Strong and Absorbent paper towels that are made with 100% Recycled Paper. These "Right-Size Sheets" are perfect for any job. They are Hypo-Allergenic and have no added dyes or fragrances. There are 140 2-ply sheets per roll. Strong and absorbent paper towels made of 100% Recycled Paper. "Right-Size Sheets" are perfect for any job. No added dyes or fragrances and hypo-allergenic.